THE WAXING CRESCENT MOON returns to the evening sky this weekend! A new lunar month begins with the first reappearance of the Moon in western twilight after the sunset. 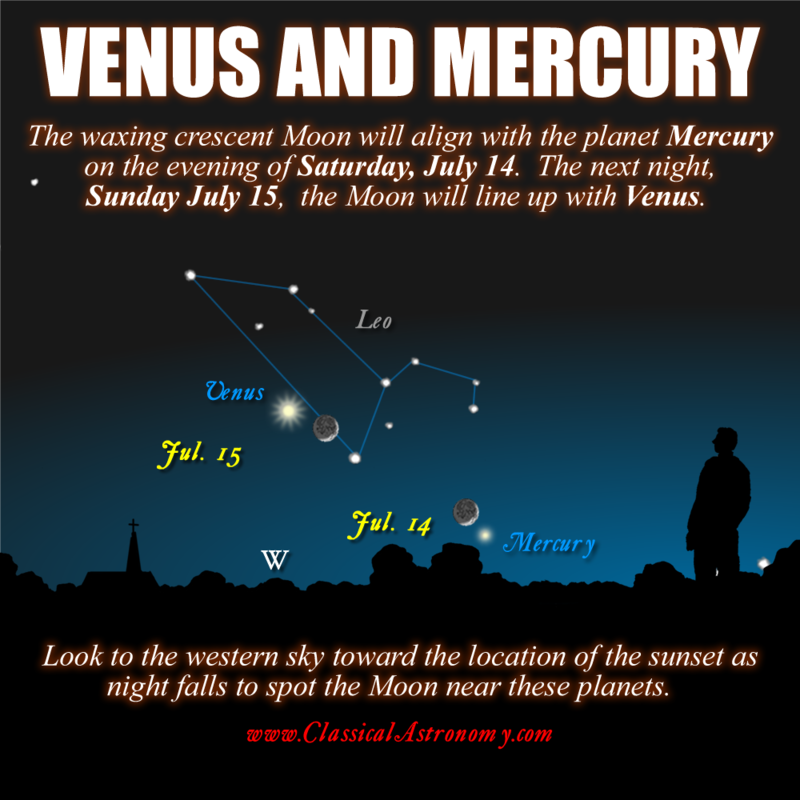 Look for the Moon aligned with the elusive planet MERCURY after sunset on the evening of Saturday, July 14. Mercury is a tough object to spot under good circumstances since it not very bright and only appears close to the horizon in bright twilight. You’ll need a flat horizon, unobstructed by trees or other ground objects. Looking out over water would be ideal. But if you can see the thin crescent Moon at this time, you should also be able to spot little Mercury. If you do, take joy in knowing you’ve bagged one of the trickiest objects in the sky! You’ll have no trouble the next evening, Sunday, July 15, spying the Moon near VENUS, the Evening Star. Venus is blazingly bright, the brightest object in the sky after the Moon. Also, Venus is higher above the horizon than Mercury and an easy object to sight on any clear evening. Look to the west after the dusk twilight has faded to see this beautiful conjunction of the Moon and Venus as night falls on Sunday night. You might also be able to pick out the Moon near the bright star REGULUS in the constellation LEO.